A games studio set up by a team of entrepreneurial graduates has secured financial support from an industry talent development scheme. 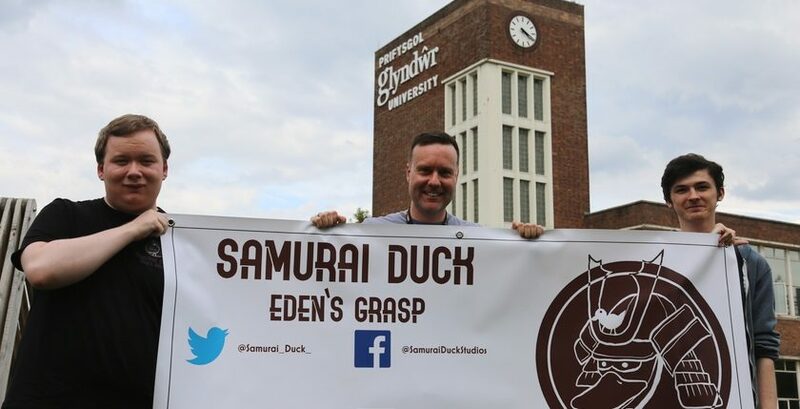 ‘Samurai Duck’ is the latest games studio from Wrexham Glyndŵr University to secure development cash from the UK Games Fund as part of the Tranzfuser programme. The programme is designed to help develop new teams in the games industry and funded by a range of contributors, including the UK Government. In total, 18 teams including Samurai Duck have been selected for Tranzfuser 2018. The Samurai Duck team have been given a £5,000 grant and are now in the final stages of developing their first demo product in time for EGX, the UK’s largest game show in September. Senior lecturer in computing, Richard Hebblewhite, said: “This is the second consecutive year that companies set up by our students have been successful in securing start-up funding from the Tranzfuser programme. “In recent years, we have been working towards a more entrepreneurial mindset – and that’s helped to create seven games studios since 2016. The Tranzfuser successes are the latest achievement of Glyndŵr’s renowned computer game development courses. Staff and students at Glyndŵr have been developing North Wales as a key hub for games development for more than ten years, with major industry events such as largest games and tech expo, LevelUpWales, and games conference, InitGame, taking place at the University. Graduates from Glyndŵr are now working in top UK games studios such as Rockstar, Ubisoft and Rebellion. Luke Wilbraham, from Buckley, is one of the members of the Samurai Duck studio. He said: “Finding out we had won a Tranzfuser place was quite a big surprise. We knew we were going up against a great group of people in the competition, but we went through everything over and over again, worked as hard as we could, gave it our all – and managed to win. The team are currently putting the finishing touches to their products in Glyndŵr’s Enterprise Lounge – a specially-provided area where new businesses such as Samurai Duck can work on their projects and grow at a rate that suits them. Richard added: “All Tranzfuser teams are given full access to our Enterprise Lounge incubation centre, where they work alongside other student and external games studios in a vibrant, productive and encouraging atmosphere. We currently have five teams working in the Lounge. “We are very lucky in that we enjoy a close and productive relationship with all of our Tranzfuser teams, and take pride in helping them grow into successful businesses. You can find about for more about the BSc (Hons) Computer Game Development and Enterprise Course, and how you can get involved on the university’s website.